"The Banjo was something I really liked, but when the guitar came along, to me that was my first love in music." Quoted in Dirty Linen magazine, June/July 1995. Because Doc came to fame in the 1960s, after he had turned forty, it is easy to forget that he was born earlier (1923) than any of the other pioneers of bluegrass lead guitar: Earl Scruggs (1924), George Shuffler (1925), Don Reno (1927), Dan Crary (1939), Clarence White (1944), or Tony Rice (1951). Doc’s childhood musical influences pre-dated bluegrass. Indeed, the young man listened to the very same 78 rpm records, radio broadcasts, and local live performances that shaped the founders of bluegrass. Deep Gap is a pass in western North Carolina’s Blue Ridge mountains, named by Daniel Boone. Doc was born and spent his entire life there. Watauga County has a rich musical tradition (birthplace of country recording pioneer Al Hopkins) and is near to other old-time music heartlands in Virginia, West Virginia, Tennessee, and Kentucky. In his first year of life, Watson lost his eyesight to an infection. The sixth of nine siblings, he never lacked for companionship and was expected pull his weight around the home and farm. The Watsons were a singing family. His mother sang ballads around the house and to lull the children to sleep. His father led shape-note hymns at the Mt. Patron Baptist Church. Given a harmonica at age six, the boy devised a single-string accompaniment using a a steel wire stretched across the woodshed door. When he was seven, the family acquired a wind-up record player and a large stack of old records. His father made him a banjo at age eleven. By then, Watson had entered the Governor Morehead School for the Blind at Raleigh. There he was exposed to classical and jazz music, including recordings by guitarists Django Reinhardt and Nick Lucas. A friend at school taught him a few guitar chords. Not knowing this, Watson’s father offered to help buy his son a guitar if he could learn to accompany himself on one song. Doc’s first guitar was a twelve-dollar Stella, which he acquired at age thirteen. About five years later, he financed his first Martin instrument by playing on the street for tips. At a station in Lenoir, NC, an announcer mentioned that Arthel wasn’t a good radio name and a member of the studio audience shouted, “Call him Doc!” The nickname stuck. After his marriage to a neighboring fiddler’s daughter at twenty-four (Rosa Lee was sixteen), Watson tuned pianos to support his growing family. Eddy Merle was born in 1949 and Nancy Ellen in 1951. In 1953, Doc got a job playing electric guitar in a local country band. Unable to afford two instruments, he traded his Martin for a Gibson Les Paul. The group often lacked a fiddler and Watson taught himself fiddle tunes on the electric instrument, in addition to the popular finger-style music of Merle Travis and Chet Atkins. Folklorist/musician Ralph Rinzler came to the Union Grove, North Carolina, Fiddler’s Convention in April, 1960. There he rediscovered pioneer recording artist Clarence Ashley playing under the name “Tom” with a pick-up band that included Doc Watson. Rinzler arranged for Ashley to record for Folkways. Doc made several northern tours with Ashley. Most folk venues lacked the budget for a full group, so in 1961 he began playing as a solo artist. He traveled with Ralph Rinzler or by inter-city bus, performing at first with borrowed guitars. He mined the song repertoires of his family, in-laws and neighbors for material that would be considered traditional, fresh, and interesting. He went back into the old-time and blues records he had heard as a child and – for a time, at least – packed away the jazz, rock, and modern country for which he was best known locally. Sensitive, complex, and capable in a range of fields (from rockabilly to electronics), Watson knew that the young, disoriented generation that came to his concerts and bought his records most warmed to that side of his personality that was fatherly, calm, and perfectly straightforward. They loved the mountain man who could teach them about country ways in terms that were simple but clever, who could play with lightning speed and stunning precision, and who could educate them about this music and the people and places from which it arose. Folk music artists at the time consisted mostly of elderly pioneer, revered but exotic and difficult to approach, and young urban revivalists. Doc Watson stood out, an authentic folk musician who could entertain and relate to them as others – and their own fathers- couldn’t. Doc was the hit of the 1963 Newport Folk Festival and quickly became a star, but was very different path from that of rural contemporaries who worked the Grand Ole Opry and the bluegrass circuit. In the 1960s, Ralph Rinzler managed both Doc Watson and Bill Monroe, booking them into the same colleges, festivals, and folk clubs. When Doc and Bill appeared together, they enjoyed recreating 1930s Monroe Brothers songs that Watson had memorized from 78 rpm records, and soon added this feature to their stage show. In December of 1966 Lester Flatt and Earl Scruggs invited Doc Watson to Nashville to add his widely popular flatpicking guitar to a Columbia album called Strictly Instrumental, issued under all three of their names. Five years later, Watson was a participant with Scruggs, Jimmy Martin, Vassar Clements, his guitar hero Merle Travis, and other country music pioneers on the Nitty Gritty Dirt Band’s first Will the Circle Be Unbroken. 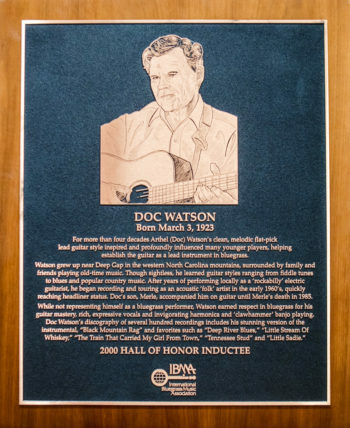 Folk music faded as a commercial phenomenon, but Doc Watson was just hitting his stride as a performer and recording artist. Freed from the pressures to make only traditional music, Doc brought modern elements back to his sound. He also added other memebers to his ensemble, including T. Michael Coleman on electric bass, and after son Merle’s death in 1985, Jack Lawrence, Marty Stuart, and grandson Richard on second guitar. 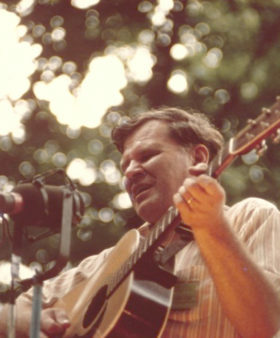 In his eighth decade Doc Watson reduced his touring but was still a revered figure in American music. Although he never represented himself as a bluegrass artist, he was a favorite with bluegrass fans, cited as a primary influence by all of the increasingly prominent flatpicking lead guitarists in the genre. Just as he mined the repertoire of his predecessors, young artists are introducing Doc’s music to their generation. Alison Krauss brought “Down in the Valley to Pray” to the 2000 movie O Brother; Where Art Thou? and “Your Lone Journey” to the Grammy-winning Raising Sand she recorded in 2008 with Robert Plant, an original member of Led Zeppelin. Doc underwent colon surgery after a fall at his home in May, 2012. He died a few days later at the Wake Forest Medical Center in Winston-Salem, NC, at the age of eighty-nine. Clarence Ashley, on folk tours and recordings, 1960-1962. Doc’s widow Rosa Lee (1931-2012) was the daughter of Gaither Carlton, a neighbor and old-time fiddler. Married in 1947, Rosa Lee and Doc composed “Your Lone Journey” about their separations during Doc’s early 1960s travels as a performer. Son Eddy Merle (named for Eddy Arnold and Merle Travis, and the namesake of Merlefest) was Doc’s musical and touring partner from his middle teens until his death at thirty-six in a farming accident. Appeared at the first multi-day bluegrass festival, Fincastle, Virginia, 1965. Doc’s first Gallagher guitar, which he named “Old Hoss,” is on display at the Country Music Hall of Fame in Nashville, Tennessee. The most significant influence on lead guitar in bluegrass music. Most famous for his flat-picked arrangements of fiddle tunes, Doc is also widely appreciated for his guitar finger-picking, old-time banjo playing, harmonica, and rich vocals. Released more than 40 albums. Received seven Grammy awards in 1973, 1974, 1979, 1986, 1990, 2002, and 2006, and the Grammy Lifetime Achievement Award in 2004. National Heritage Fellowship, National Endowment for the Arts, 1988. National Medal of Arts, 1997. Bluegrass Hall of Fame, 2000. 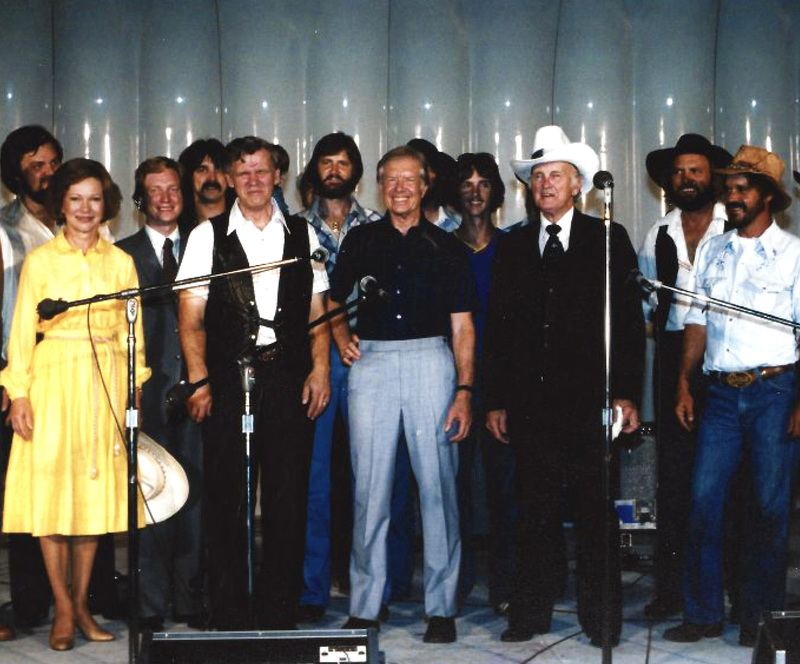 From the Archives: Bill Monroe on outside stage at night standing with, first row from left to right, First Lady, Mrs Jimmy Carter, Doc Watson, President Jimmy Carter, Bill Monroe and unidentified man. A group of unidentified people can be seen standing behind them. The occasion was "A Georgia Barbecue" hosted by President and Mrs Jimmy Carter at the White House on 7 August, 1980. Donated by the Jimmy Carter Presidential Library and Museum. From the Archives: Doc and Merle Watson. 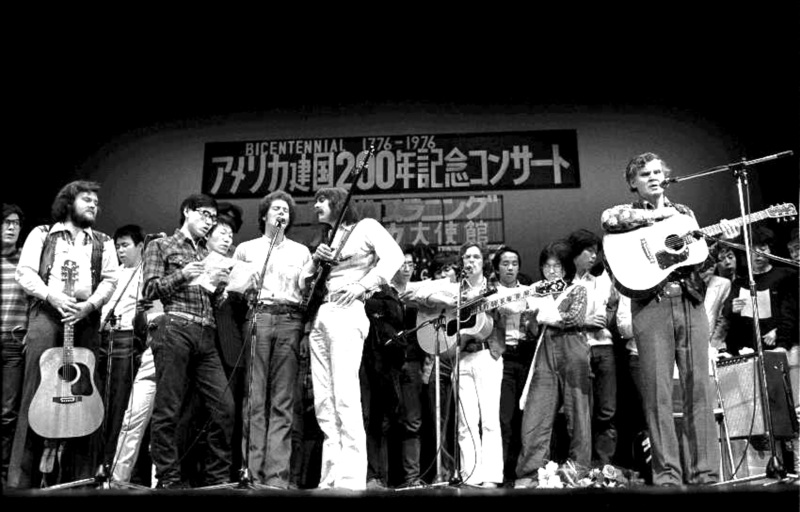 Doc Watson came to Japan to celebrate 200 years of US independence in Tokyo. Photo by Nobuharu Komoriya. 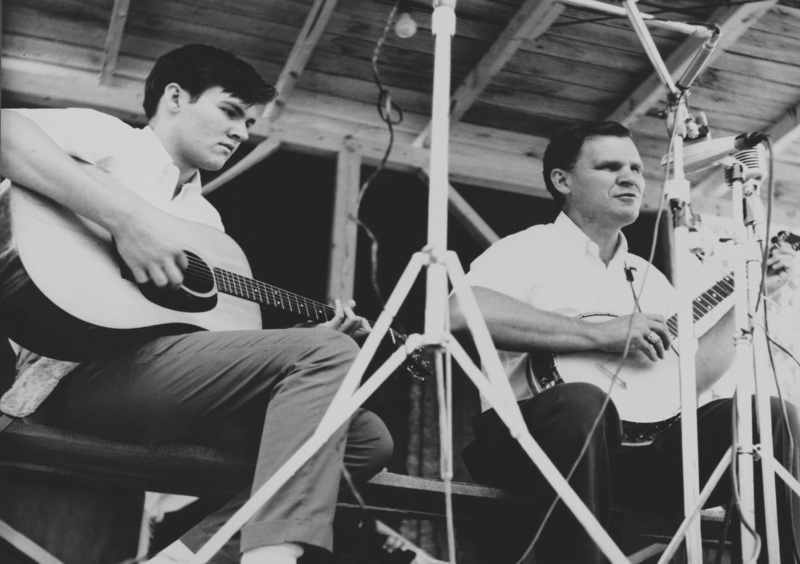 From the Archives: Merle and Doc Watson at the Roanoke Blue Grass Festival in Fincastle, Virginia 1965. Photo by Ron Petronko. "Doc has picked the fiddle tunes when the fiddler didn't show and played rock 'n' roll for the drunks at the VFW because, by God, ten dollars was a lot of money and he had a family to feed and clothe." Joe Wilson in "Doc Watson: Just One of Us," Muleskinner News, June 1974. "The late Ralph Rinzler, the wonderful guy who helped me get started, said, 'Doc, play the old-time things till you get your foot in the door, and then you can expand." Quoted by Barry Mazor in Meeting Jimmie Rodgers, 2009. "As we discussed the events and changes in Doc's life during the past fifteen years, I asked if any particular one thing stood out as the most important, Doc thought for a moment, smiling...'One day I came home from a trip, sat down, and wrote to the people with the State, and told them I wouldn't be needing their help anymore."